Cardiac prosthetics are chronic alternatives that replace a damaged or diseased part in the body.Cardiac prosthetic devices are used in the treatment of blockages in heart valves. Implantation of cardiac prosthetic devices is being increasingly accepted as one of the common procedures due to a rise in the number of patients suffering from valvular diseases. Prosthetic valve thrombosis (PVT), prosthetic valve endocarditis (PVE), mechanical hemolytic anemia and thromboembolism are some of the complications that involve the failure of primary valves. Furthermore, these devices tend to improve the quality of life by reducing the morbidity and mortality rate by replacing diseased valves. It is been estimated that more than 60,000 patients undergo heart valve replacement in the U.S. every year. Thus, the usage and acceptance of cardiac prosthetic devices is on risemainly due to technological advances and better performance. Escalation in cardiac disorder prevalence is contributed by the factors such as rise in geriatric population, high obesity epidemic and rapidly changing lifestyle. The global cardiac prosthetic devices market was valued at USD 2,945.3 million in the year 2012 and is expected to record a growth rate of 8.7% during the forecast period from 2013 to 2019, to reach an estimated value of USD 5,290.0 million by 2019. 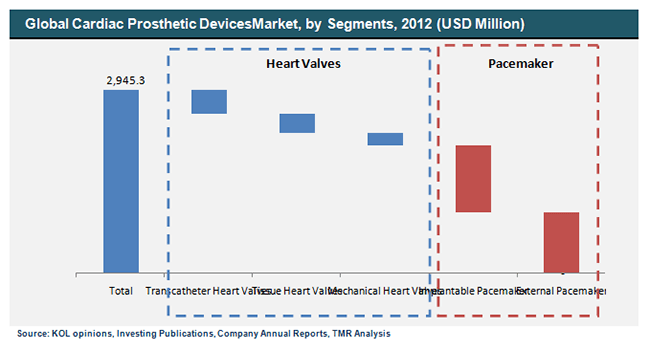 The cardiac prosthetic devices market can be analyzed by the types of heart valves and pacemakers. The various types of heart valves currently available are mechanical heart valves, tissue heart valves and transcatheter heart valves. These devices are used to replace the affectedheart valves in patients. Heart valve disorders can arise from three types of malfunction: regurgitation, stenosis and atresia. A heart valve disease, if not treated in time, can lead to various heart diseases such as stroke, heart failure, cardiac arrest and blood clots. Rising geriatric population, changing lifestyle and increasing partnership among vendors are the factors influencing the growth of the heart valves market globally. Pacemakers are further categorized as implantable pacemaker and external pacemaker. Pacemakers are cardiac prosthetic devices that assist in controlling abnormal heart rhythms. These devices are implanted in patients suffering from cardiac arrhythmia, a heart disorder featured by an uneven pattern of heartbeats. Geographically, North America accounts for the largest percentage share of the global cardiac prosthetic devices market accounting for over35% of the total market. This is justified by the presence of technologically updated infrastructure and well trained healthcare professionalsin this region compared to other regions. In addition, rising prevalence of cardiac diseases and established healthcare policies has further augmented the growth and development of cardiac prosthetic devices market in this region.Asia-Pacific region is anticipated to record high growth rate owing to increased participation of respective governments in improving the overall healthcare sector and huge untapped potential in these regions. In addition, rise in disposable incomes and increased preference of the population to avail technologically advanced medical solutions further support the growth of cardiac prosthetic devices market. The overall cardiac prosthetic devices market is highly fragmented with the presence of both established and emerging companies in this field that includes Edwards Lifesciences Corporation, Medtronic, Inc., Boston Scientific Corporation, St. Jude Medical, Sorin Group and others. The factors that contribute in the growth of overall cardiac prosthetic devices are continuous product modifications and upgradations followed by technological advances and increased preference for minimally invasive procedures. However, high cost of the products and procedures may limit the growth prospects for the development of cardiac prosthetic devices market. The research report comprises a comprehensive analysis of the global market for cardiac prosthetic devices. The report throws light on factors such as the market’s competitive landscape, production capacities of key businesses, resource utilization, demand and supply patterns, and recent developments in the market, with the help of qualitative and quantitative elaboration on the market. The market study focuses mainly on the drivers, opportunities, and restraints that are shaping the global market for cardiac prosthetic devices. The facts, figures, and data in the report are based on a variety of primary and secondary research methodologies. Useful insights from industry experts are also included in the report. Porter’s five forces and SWOT analysis are the two key analytical tools used to analyze the strengths, weaknesses, challenges, and opportunities in the market. With an extensive collection of data elements such as tables, charts, graphs, and figures, the report on the global cardiac prosthetic devices market presents demand, resource utilization, and investment patterns in an easy-to understand manner. The historical data, along with the current market statistics, make it easy to analyze the development of the market over the past years. The report analyzes the market’s state in key regional market segments to present a comprehensive comparative analysis. The report’s section on competitive analysis includes details of key businesses operating in the global cardiac prosthetic devices market in terms of company overview, product portfolio, financial performance of businesses, demand drivers, and key developments. The report states that the rising prevalence of a number of cardiovascular diseases related to cerebrovascular, valvular, rheumatic, coronary artery, and peripheral vascular conditions is the key demand driver for the global cardiac prosthetic devices market. A number of other factors, such as rising preference for minimally invasive treatment methods, continuous upgradation and modification of products, rising population of obese and aged people across the globe, and busy modern lifestyles, are also significantly contributing to a constant rise in demand for cardiac prosthetic devices. The report segments the global cardiac prosthetic devices market broadly on the basis of types of heart valves and pacemakers, and key regional markets. On the basis of types of heart valves, the market is segmented into mechanical heart valves, tissue heart valves, and transcatheter heart valves. Types of pacemakers studied in the report include implantable and external pacemakers. The regional markets of North America, Asia Pacific, Europe, and the Rest of the World (RoW) are studied in the report. With a market share of nearly 35%, the regional market of North America led the global cardiac prosthetic devices market in 2012. Established healthcare policies, easy availability of high-end technologies, updated infrastructure, and presence of well-trained healthcare personnel are responsible for the dominant position of the North America market for cardiac prosthetic devices. The market for cardiac prosthetic devices is expected to flourish at the fastest pace in the Asia Pacific market owing to rising participation of government bodies in an effort to improve healthcare facilities in these regions. The report includes detailed profiles of key businesses operating in this highly fragmented marketplace, including Boston Scientific Corporation, St. Jude Medical, Edwards Lifesciences Corporation, Medtronic, Inc., and Sorin Group.